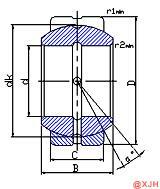 The Spherical Plain Bearing GEG.e Series can withstand large radial loads and thrust loads in both directions. Moreover, since it has high impact load resistance, it is most suitable for low-speed heavy-load rocking parts such as cylinder rotation support parts, hinge parts, and truck suspension buffers of various construction machines and civil engineering machines. The Spherical Plain Bearing GEG.e Series consists of an inner ring with a convex spherical outer diameter face and an outer ring with a corresponding concave spherical inner diameter face. This design is particularly suitable for bearing arrangements that must withstand the misalignment between the shaft and the housing, or must be able to reciprocate or periodically yaw or swivel at a relatively slow sliding speed, usually To withstand heavy loads.